3. That's it. It's super easy, and Swagbucks is for real. 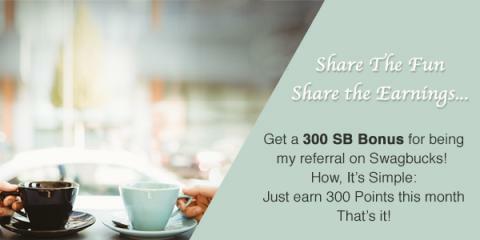 I use it myself, and I've earned 54,686 SB in the time that I have been a member! That is equivalent to over $620 in Amazon gift cards if you order the $25 gift card with the monthly discount of 2200 SB! They're a completely free, no strings attached site that rewards you for all of the things you're already doing online. Searching the Internet, Watching Videos, Playing Games, Taking Surveys, Shopping and more. As you do these activities, you'll earn Swagbucks. Swagbucks are reward points that you can redeem for all sorts of gift cards in the Rewards Store. You can also download their toolbar or download their OS and Android apps for more opportunities to earn. I highly recommend the toolbar. I get a lot of my points by searching using the toolbar. It also makes it easy to search for Swag Codes. Choose the activities you like or have time for - how much you earn is up to you! Fee free to ask me questions if you have them. I will say this: as a "thrifty and frugal" blogger I have signed up for every rewards, survey, cash back, etc. program out there and Swagbucks is hands down the best. I have definitely made more money from them than any other program.